Wells Fargo workers are fighting back. Six former Wells Fargo (WFC) employees filed a class action lawsuit on Monday in federal court against the bank seeking $7.2 billion or more for workers nationwide who were fired or demoted after refusing to open fake accounts. The action builds on a class action lawsuit that was filed last week by two former Wells Fargo workers in California, opening it up to employees around the country. The federal class action suit accuses Wells Fargo of orchestrating a "fraudulent scheme" to boost its stock price that forced employees to "choose between keeping their jobs and opening unauthorized accounts." "We're being inundated with emails. Every minute there's new people, new stories and new allegations," Jonathan Delshad, the Los Angeles attorney who launched the class action suits, told CNNMoney. In a statement, Wells Fargo said: "We disagree with the allegations in the complaint and will vigorously defend against the misrepresentations it contains." 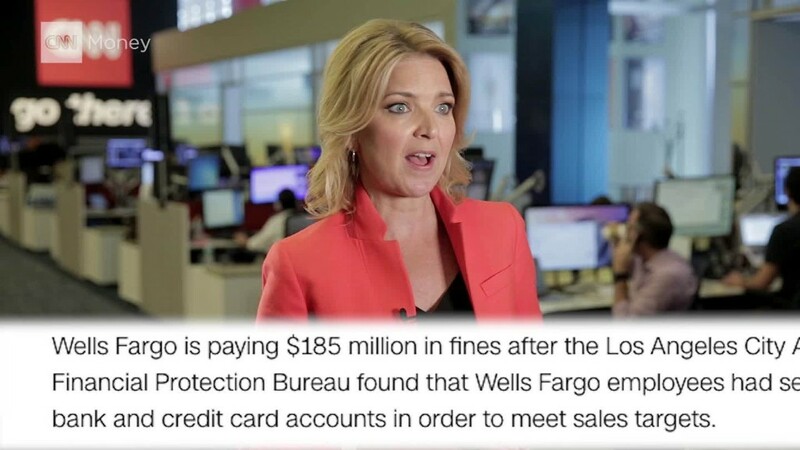 It's the latest legal headache facing Wells Fargo, which earlier this month was fined $185 million for inflating sales metrics with creating as many as two million fake bank and credit card accounts. Wells Fargo also faces a hearing in the House, an investigation from the Department of Justice and is still reeling from a grilling by the Senate banking committee last week. Wells Fargo has said it fired a stunning 5,300 employees since 2011 for the improper sales tactics. But dozens of former Wells Fargo workers have reached out to CNNMoney to say they were fired after refusing to open unauthorized accounts -- or even after they called the ethics hotline about what they were seeing. Alexander Polonsky and Brian Zaghi, two former Wells Fargo employees from Los Angeles, say they were terminated after failing to meet unrealistic sales goals of opening 10 accounts per day. Last week, the two filed the lawsuit in California Superior Court alleging "wrongful termination/retaliation," violations of California labor code, failure to pay wage and other charges. The suit represents California employees who worked at Wells Fargo in the past 10 years or who continue to work there and were fired, demoted or forced to resign due to not meeting their sales quotas. Employees who refused to take part in the scam were "systematically and routinely terminated," while those who did open unauthorized accounts were often promoted, the lawsuit alleges. Nearly a half-dozen Wells Fargo employees even reached out to CNNMoney to say they were fired after flagging unethical sales tactics by calling the company's ethics hotline. The federal class action alleges Wells Fargo violated several laws, including Dodd-Frank and the section of Sarbanes-Oxley that prohibits retaliation against whistleblowers. Additionally, the lawsuit claims Wells Fargo made employees work beyond eight hours a day without paying overtime, violating the Fair Labor Standards Act. Both suits said Wells Fargo workers suffered damages including loss of income, back pay as well as "emotional distress" and "mental anguish." Wells Fargo, in a statement, said it "works hard to foster a culture that is centered on doing what is right for our customers and exhibiting high ethical standards and integrity." The company added that "the vast majority of our team members serve our customers' best interests every day in every interaction."